When your dentist performs an oral cancer screening during your dental examination, he/she will look for red or white spots, bleeding, lumps, difficulty swallowing, loose teeth, any color changes, and mouth sores. Is is vital to tell your dentist if your bite has changed, if you have sores that won’t heal, and prolonged hoarseness. An earache in only one ear can also be an indicator. The existence of any of these symptoms does not mean you have oral cancer, as they can be caused by any number of other conditions. However, if your dentist does discover something unusual, he/she may order additional tests or refer you to a medical doctor for further diagnosis and treatment if necessary. 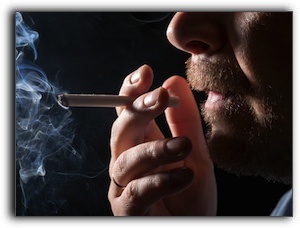 It’s probably no surprise that the main risk factor for oral cancer is tobacco use. This includes all forms, not just cigarettes. Those who consume excessive amounts of alcohol are also more likely to contract this deadly cancer. People with HPV, a sexually-transmitted virus, have a higher risk and prolonged sun exposure to lips makes lip cancer more likely. All of these previously mentioned factors are lifestyle-related and, to a great extent, preventable. People who don’t use tobacco or drink heavily are statistically far less likely to get oral cancer and a host of other health problems. For more information about oral cancer screening, contact Kenneth Hovden DDS at 650-755-6000. If you are looking for an experienced dentist who provides comprehensive general, restorative, and cosmetic dentistry, we invite you to schedule a consultation with Dr. Kenneth Hovden. Dr. Hovden has been serving the Daly City area since 1981. 1“Oral Cavity and Oropharyngeal Cancer,” The American Cancer Society, January 6, 2015, http://www.cancer.org/cancer/oralcavityandoropharyngealcancer/detailedguide/oral-cavity-and-oropharyngeal-cancer-key-statistics, accessed on January 9, 2015. What Does Your Daly City Dentist Need To Know?